Apr28 by John M. Buol Jr.
Apr22 by John M. Buol Jr.
Sept. 8-11 at the 2014 US Army Long Range Championships. Congrats to Col. Denise Loring of the U.S. Army Reserve Marksmanship Team for being featured in the April 2014 Edition of Shooting Sports USA. Team USA Olympian and USAR CMP shooter SFC Keith Sanderson ruled the 25m Rapid Fire Pistol Men final, coming back after arm surgery, outscoring the 2008 Olympic Bronze medallist Christian Reitz of Germany, finishing in the lead with 7 hits of advantage on his followers. “The hardest five round I have ever shot since the 2008 Olympics,” Sanderson said. The 2014 ISSF Rifle and Pistol World Cup in Fort Benning, GA, USA, was closed by the 25m Rapid Fire Pistol Men medal match, today. And it ended up in the best way for the host country, USA, thanks to two-time Olympian Keith Sanderson, who claimed Gold in front of his teammates and supporters. The 39-year old athlete climbed upon the highest step of the podium with 33 hits in the final, beating Germany’s 2008 Olympic Bronze medallist Christian Reitz (second with 26 hits) and China’s first time participant Chen Kehan, 21, who closed the match in third with 23 hits. Following them, the two Russian teammates Vlatcheslav Kalioujnyi and Alexei Klimov placed in fourth and fifth place with 18 and 16 hits, respectively, while Kazakhstan first-time finalist Sergey Vokhmyanin ended up in sixth and last place with 9 hits. Spotlights turned on Sanderson, who overcame off-season arm surgery to come back atop of an ISSF podium after missing for five years. He had indeed won his last world cup Gold medal in 2009, in Beijing. “Last August I went through arm surgery, to solve a problem I had since 2010.” Sanderson explained. The US Pistol shooter proved to be the best, today, starting the 2014 season in the lead. And this is a crucial season: at the ISSF World Championship, in September, the first quota places for the 2016 Olympic Games will be assigned. “The scores around the world have been going up. I want to continue perform well, and we will see what happens.” Sanderson concluded. USAR CMP Shooter takes World Cup medal, goes Triple Distinguished. Congrats to USAR Team shooter Nick Mowrer for taking a World Cup medal and racking up enough points to become triple distinguished! There are days in this Olympic world which make you stand up and take notice. Generally, they’re usually reserved for those Olympic moments that define this Movement, or on occasions when chart-topping performances are had at World Championships. But on an otherwise ordinary day, April 2, 2014, will forever be one of those days. With a proud history, complete with 107 Olympic medals and plenty of World Champions, earning distinction in the laurels of USA Shooting during an ordinary World Cup event, with no Olympic qualification at stake, takes something special. Enter Nick Mowrer. The lanky shooter who calls Butte, Mont., home did something at this week’s International Shooting Sport Federation (ISSF) World Cup in Ft. Benning, Ga., that no one in the sport has ever done by competing in a World Cup rifle event. The same shooter who represented the U.S. in the 50m Free Pistol event as a member of the 2012 U.S. Olympic Team. No one in the USA Shooting ranks can recall another shooter who has ever competed in a World Cup event in two different disciplines until Mowrer did. It would have been historical had he just competed, but compete and medal that’s what made the entire shooting community stand up and take notice. Competitive pistol shooters aren’t supposed to be good competitive rifle shooters too, or they at least NEVER have been. Mowrer earned a bronze medal shooting in a Prone Rifle event for the very first time. You know you’ve done something special when your teammates reach out in droves to applaud the performance, and that they did including Olympic teammates Jamie Gray, Matt Emmons and Sarah Scherer. It moved Gray so much that the reigning Olympic gold medalist in Women’s Three-Position rifle wrote this on her Facebook page. “Today is an amazing day…our Olympic Pistol Shooter Nick Mowrer broke into the medals in Men’s Prone (yes that is a rifle event)! Couldn’t be more excited for him and obviously his amazing shooting abilities! Nick has now impressed me twice and I have to say these are two of my most memorable shooting moments I have seen. In 2012 O Trials he had to shoot a phenomenal Free Pistol final to make the team and he stood up there and got the job done and now a Prone Rifle Bronze, nothing more to say than AWESOME!! She wasn’t the only one who took to social media to celebrate the moment. 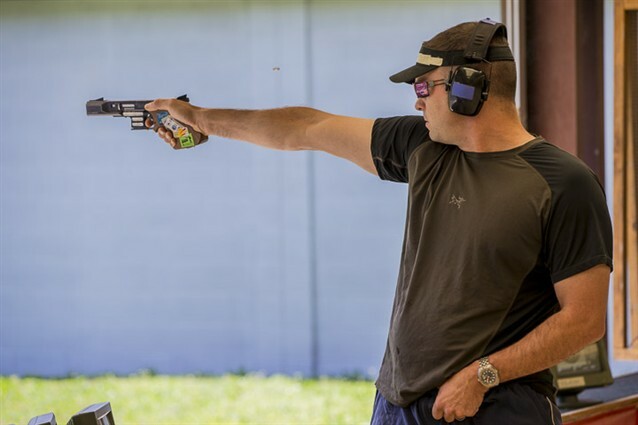 Mowrer’s medal was so momentous it overshadowed the first gold medal won by the USA Shooting Team at the World Cup when two-time Olympian Keith Sanderson overcame off-season arm surgery to win another Rapid Fire Pistol World Cup medal in his distinguished career. Even three-time Olympic medalist Matt Emmons was displaced by Mowrer’s achievement. Having not competed since London, Emmons managed a sixth-place finish in the Men’s Three-Position Rifle event. But for someone who lent shooting jackets, gun parts and expertise to Mowrer in his quest, he cared little. “Nick deserves as much press as you can possibly give him. What a story! !,” Emmons said when told that he’d been supplanted for an NRA News interview.